When I was younger, I loved all things Hello Kitty. Getting to go the Sanrio store to pick out birthday presents was a treat. I'm not into Hello Kitty stuff anymore, but there is always a new generation ready to pick up the mantle of obligatory adoration. My nieces are having a Hello Kitty themed birthday party. So I disregarded copyright laws and fashioned for them homemade, handmade personalized tote bags. I traced the different elements of the face onto No-Sew fusible paper and then ironed them onto felt. I then ironed on the pieces layer by layer. As for Jessie, if she learns how to spell her "e's" backward, well, she can always blame me for leading her down the wrong path. Nice! 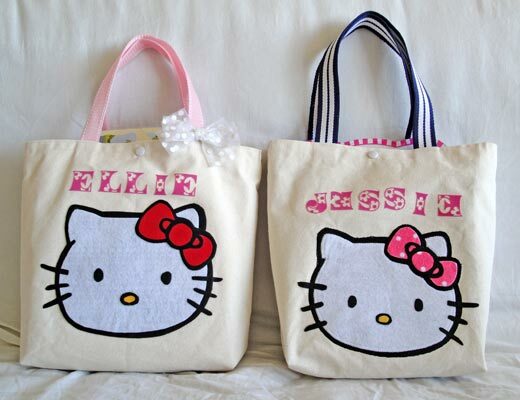 I used to adore Hello Kitty!